Posted April 30th, 2018 by admin. Did you know that research shows that your oral health is related to your overall health? We all know the saying “you are what you eat” but did you know that “you are what you eat WITH” as well? Your mouth is the gateway to your body. The mouth is directly connected to the rest of your body by the bloodstream and digestive system. Bacteria from your mouth can easily travel through your body and cause infection and inflammation wherever it goes. The mouth is the most commonly overlooked area of the body when considering wellness. When we don’t take care of our mouths, it can lead to pain, inflammation and disease. In more severe cases, it can lead to malnurishment, and to inflammatory responses in other parts of the body. A lot more research has been done in the area of inflammation and its effect on the body, and the mouth can be a big source of inflammation. Inflammation can lead to heart disease, stroke, diabetes, and pregnancy complications. If you brush and floss everyday and see your dental hygienist for regular dental cleanings, you can minimize the amount of inflammation. 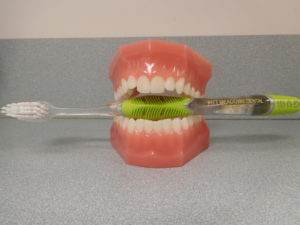 If you are unsure of the correct technique or tools to use for your mouth, ask your dental hygienist at your next visit.